Jack Plunkett - Plunkett Research, Ltd.
HOUSTON, Texas – Plunkett Research, Ltd. recently announced an important market research and competitive analysis report, Plunkett’s Food Industry Almanac, 2016 edition. A complete market research report, including forecasts and market estimates, technologies analysis and developments at innovative firms. The food and beverage industry is among the most competitive and globally-linked of all business sectors. For example, our market research shows that many of America’s best-known food packagers, such as Heinz, get 30%, 50% and even higher percentages of their total revenues from outside the U.S. American brand names such as Coca-Cola and Starbucks are known worldwide, as are European brands such as Nestle. This entry was posted in News on August 19, 2016 by Jack Plunkett. HOUSTON, Texas – Plunkett Research, Ltd. recently announced an important market research and competitive analysis report, Plunkett’s Green Technology Industry Almanac, 2016 edition. A complete market research report, including forecasts and market estimates, technologies analysis and developments at innovative firms. Green Technology has evolved to encompass a broad variety of businesses and industries. Energy conservation is a key focus, but sectors including recycling, water technology, building materials, heating and air conditioning systems, retailing, transportation, manufacturing and industrial processes are also becoming big users of innovative green technologies. As costs for such technologies become lower, adopters are beginning to see a good return on investment. HOUSTON, Texas – Plunkett Research, Ltd. recently announced an important market research and competitive analysis report, Plunkett’s E-Commerce & Internet Business Almanac, 2016 edition. A complete market research report, including forecasts and market estimates, technologies analysis and developments at innovative firms. Worldwide, the total number of people using the Internet has reached nearly 3 billion—many are on smartphones. China holds the world’s highest number of Internet users, far more than the U.S. Meanwhile, the number of American homes and businesses with broadband Internet access via landline or satellite totals 96 million, while 220 million cellphone subscriptions include fast Internet access. A vast array of new services, entertainment options and timesaving solutions has now become available online. This entry was posted in News, Uncategorized on August 19, 2016 by Jack Plunkett. HOUSTON, Texas – Plunkett Research, Ltd. recently announced an important market research and competitive analysis report, Plunkett’s InfoTech Industry Almanac, 2016 edition. A complete market research report, including forecasts and market estimates, technological analysis and developments at innovative firms. The global computer industry continues to surge ahead, with innovative new hardware, software and services. Meanwhile, important new trends are developing, including software-as-a-service, and the “cloud” of data and services housed online. Designing devices so that they consume less electric power continues to be a prime focus, while mobile devices offer a soaring market. HOUSTON, Texas – Plunkett Research, Ltd. recently announced an important market research and competitive analysis report, Plunkett’s Entertainment & Media Industry Almanac, 2016 edition. A complete market research report, including forecasts and market estimates, technologies analysis and developments at innovative firms. The global entertainment and media industry is in the midst of vast changes—giant mergers and acquisitions, new technologies and online services are changing the landscape. Globalization and digitization are affecting everything from music to movies, radio, TV and book publishing. HOUSTON, Texas – Plunkett Research, Ltd. recently announced an important market research and competitive analysis report, Plunkett’s Investment & Securities Industry Almanac, 2016 edition. A complete market research report, including forecasts and market estimates, technologies analysis and developments at innovative firms. The global investment industry is reeling from massive changes and challenges. Sovereign wealth funds have amassed trillions of dollars for investment purposes. Markets, from commodities to stocks to debt instruments and ordinary bonds, are subject to wild swings and 24/7 electronic trading. Markets and investments are increasingly globalized. Private equity funds are investing immense amounts of money; venture capital activity is strong; and hedge funds have become dominant investors in many types of assets. Corporate merger and acquisition (M&A) activity has been running at a very high rate in the U.S. and abroad. 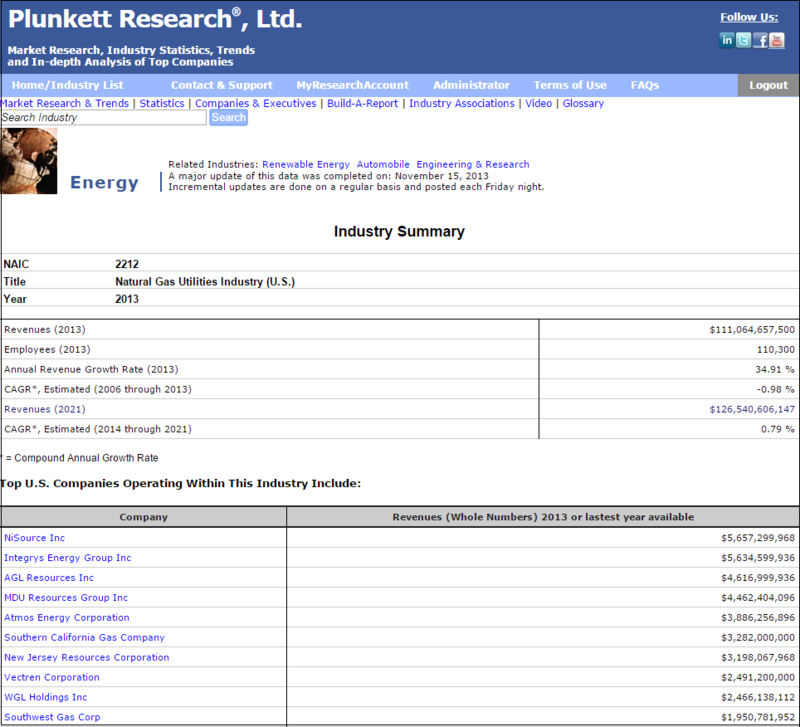 HOUSTON, Texas – Plunkett Research, Ltd. recently announced an important market research and competitive analysis report, Plunkett’s Renewable, Alternative & Hydrogen Energy Industry Almanac, 2016 edition. A complete market research report, including forecasts and market estimates, technologies analysis and developments at innovative firms. Renewable energy is improving in technology and efficiency. Nevertheless, costs remain high. Renewable energy sources and cleaner-burning fuels are of great appeal to the large number of consumers who have developed an interest in protecting the environment. For example, surveys have shown that some consumers would be willing to pay somewhat more for electricity if they knew it was coming from non-polluting, renewable sources. 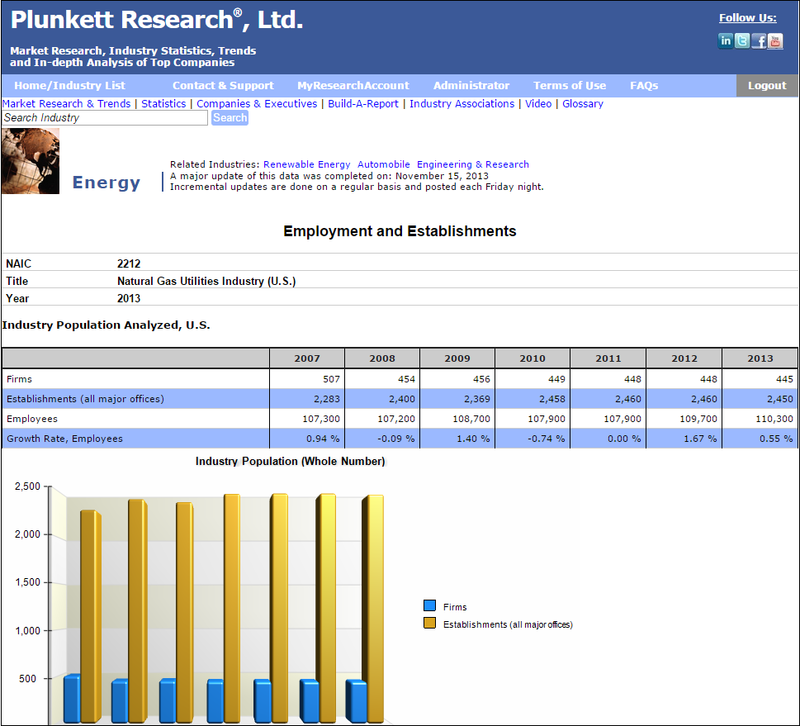 HOUSTON, Texas – Plunkett Research, Ltd. recently announced an important market research and competitive analysis report, Plunkett’s Energy Industry Almanac, 2016 edition. A complete market research report, including forecasts and market estimates, technologies analysis and developments at innovative firms. The Energy industry is boiling over with changes. New opportunities in shale oil and gas fields, giant LNG contracts, huge oil deposits in deep offshore waters, growing energy demand in emerging nations and doubts about nuclear energy are reshaping the energy business of the near future. China has become the world’s biggest energy user, while Brazil is emerging as a major producer and exporter. Meanwhile, renewable electricity sources continue to be constructed around the world, including solar, wind and wave power. HOUSTON, Texas – Plunkett Research, Ltd. recently announced an important market research and competitive analysis report, Plunkett’s Banking, Mortgages & Credit Industry Almanac, 2016 edition. A complete market research report, including forecasts and market estimates, technologies analysis and developments at innovative firms. The lending industry is comprised of a wide variety of sectors, such as banking, credit cards, mortgages, leasing and consumer finance. Many of these sectors have interconnections and synergies. In addition, a large number of related services and technologies have a major influence on the lending and credit business. These services include e-commerce, credit risk analysis, call centers and information technologies. HOUSTON, Texas – Plunkett Research, Ltd. recently announced an important market research and competitive analysis report, Plunkett’s Insurance Industry Almanac, 2016 edition. A complete market research report, including forecasts and market estimates, technologies analysis and developments at innovative firms. The insurance industry is increasingly globalized as cross-border investments and acquisitions change the landscape. Better risk management, specialty insurance products and increased use of underwriting information systems have led the way. Risk management consulting and analysis have become more sophisticated. In addition, a large number of related services and technologies have a major influence on the insurance and risk management business. These services include e-commerce, call centers and information technologies. Major carriers continue to add new products, with a growing focus on serving aging consumers with their health coverage, asset management and investment planning needs. HOUSTON, Texas – Plunkett Research, Ltd. recently announced an important market research and competitive analysis report, Plunkett’s Health Care Industry Almanac, 2016 edition. A complete market research report, including forecasts and market estimates, technologies analysis and developments at innovative firms. HOUSTON, Texas – Plunkett Research, Ltd. recently announced an important market research and competitive analysis reference report, The Almanac of American Employers, 2016 edition. A complete market research report, including forecasts and market estimates, technologies analysis and developments at innovative firms. The Almanac of American Employers leads job seekers doing employment research to 500 of the largest, most successful companies that are hiring in America. Since 1985, our team has been producing this famous book, now a standard item in recruiting and placement offices. Plunkett Research, Ltd. recently announced an important market research and competitive analysis reference report, Plunkett's Automobile Industry Almanac, 2016 edition. A complete market research report, including forecasts and market estimates, technologies analysis and developments at innovative firms. The automobile business is evolving rapidly on a worldwide basis. Car parts manufacturers are merging, component design and manufacture are now frequently outsourced instead of being created in-house, and brands are changing. Meanwhile, all of the biggest, most successful automobile industry firms have become totally global in nature. Globalization is in evidence throughout the automobile industry, and auto sales in emerging markets are booming. On the car dealership side, giant, nationwide holding companies have acquired the best dealers in major markets. Even the used car business is being taken over by national chains. Electric vehicles are now available, but are selling in very small numbers. This entry was posted in Uncategorized on August 18, 2016 by Jack Plunkett. HOUSTON, Texas – Plunkett Research, Ltd. recently announced an important market research and competitive analysis reference report, Plunkett’s Manufacturing & Robotics Industry Almanac, 2016 edition. A complete market research report, including forecasts and market estimates, technologies analysis and developments at innovative firms. The manufacturing and robotics sectors have become tightly intertwined in recent years, thanks to the rapidly growing importance of factory automation. On factory floors ranging from machine shops to automobile plants to electronics factories, computer-driven equipment plays a vital role in manufacturing worldwide. HOUSTON, Texas – Plunkett Research, Ltd. recently announced an important market research and competitive analysis reference report, Plunkett's Airline, Hotel & Travel Industry Almanac, 2016 edition. A complete market research report, including forecasts and market estimates, technologies analysis and developments at innovative firms. The travel and tourism industry is going through strategic changes in order to boost profits. Airlines are charging numerous fees in a bid to boost revenues per seat and per passenger mile. Cruise lines are building the largest ships yet in a bid for better efficiency and increased profits per passenger. Meanwhile, leisure tourism is growing along with business travel, although many travelers are watching expenses carefully. New hotel properties are being constructed at a rapid clip. One of the brightest trends is a vast number of Chinese leaving home to travel the world for the first time. HOUSTON, Texas – Plunkett Research, Ltd. recently announced an important market research and competitive analysis reference report, Plunkett's Biotech & Genetics Industry Almanac, 2016 edition. A complete market research report, including forecasts and market estimates, technologies analysis and developments at innovative firms. Scores of promising new drugs are in clinical trials. Laboratories at leading universities are partnering with pharmaceuticals companies to push research and development along at faster levels. Meanwhile, nations such as China and Singapore are fostering innovation with massive investments in new R&D centers of their own—some of which are focused on stem cell technology. The promise of personalized medicine is starting to come into fruition, with many types of personal genetic diagnostic services being offered. 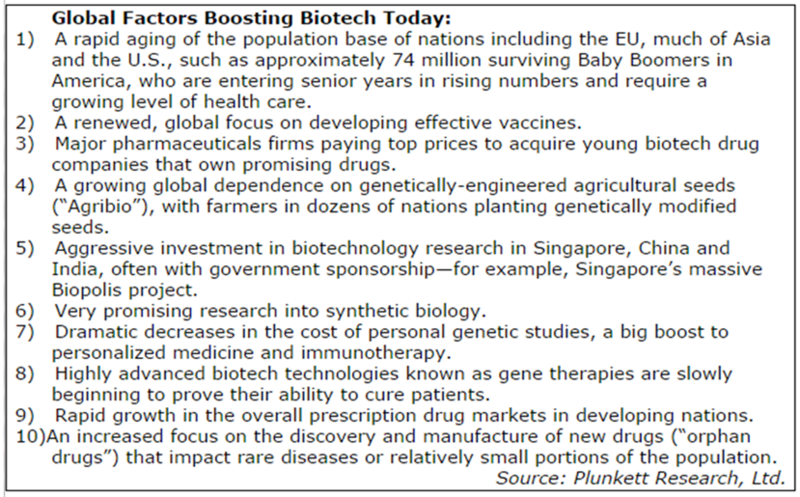 Also, genetically-modified foods are benefiting from the development of agricultural biotechnology at leading suppliers. HOUSTON, Texas – Plunkett Research, Ltd. recently announced an important market research and competitive analysis report, Plunkett's Telecommunications Industry Almanac, 2016 edition. A complete market research report, including forecasts and market estimates, technologies analysis and developments at innovative firms. No other industry touches as many technology-related business sectors as telecommunications, which by definition encompasses not only the traditional areas of local and long-distance telephone services, but also advanced technology-based services including wireless communications, the Internet, fiber optics and satellites. Telecom is also deeply intertwined with cable TV systems, since cable companies are now aggressively offering local exchange service and Internet service. The relationship between the telecom and cable sectors has become even more complex as telecom companies are now selling TV via IP (Internet protocol) services, competing directly against cable for consumers' entertainment dollars. HOUSTON, Texas – Plunkett Research, Ltd. recently announced an important market research and competitive analysis report, Plunkett's Almanac of Middle Market Companies, 2016 edition. A complete market research report, including forecasts and market estimates, technologies analysis and developments at innovative firms. Our new Plunkett's Almanac of Middle Market Companies and our online Middle Market Industry Research Center are designed to be time-saving business development tools for professionals, marketers, sales directors, consultants and strategists seeking to understand and reach middle market American companies. It will also be of great use to placement, recruiting and human resources professionals, as well as professionals working in economic development, lending and media. Profiles of middle market health care services and products firms. HOUSTON, Texas – Plunkett Research, Ltd. recently announced an important market research and competitive analysis report, Plunkett's Chemicals, Coatings & Plastics Industry Almanac, 2016 edition. A complete market research report, including forecasts and market estimates, technologies analysis and developments at innovative firms. The chemicals manufacturing industry is a vibrant, global business that encompasses many important sectors. Key products include petrochemicals, fertilizers, plastics, coatings, ceramics, solvents, additives, dyes and many other products basic to home and business needs. In addition, the pharmaceuticals industry is often included when discussing chemicals. Commodity chemicals, specialty chemicals and custom manufacturing are vibrant components of the business. HOUSTON, Texas – Plunkett Research, Ltd. recently announced an important market research and competitive analysis reference report, Plunkett’s Sports Industry Almanac, 2016 edition. A complete market research report, including forecasts and market estimates, technologies analysis and developments at innovative firms. The sports business is a dynamic and growing industry in the U.S., Europe, Asia Pacific and elsewhere. In addition to major sporting leagues and teams, related sectors include sporting goods manufacturing, sports apparel, sporting events broadcasting and retailing. In addition, sports and the athletes who play in sports by their nature, attract companies interested in endorsements, advertising, merchandising and marketing opportunities. Our Plunkett’s Sports Industry data covers these sectors in detail, giving users convenient access to sports business data. HOUSTON, Texas – Plunkett Research, Ltd. recently announced an important market research and competitive analysis report, Plunkett’s Outsourcing & Offshoring Industry Almanac, 2016 edition. A complete market research report, including forecasts and market estimates, technologies analysis and developments at innovative firms. Outsourcing of all types, along with the offshoring of business processes and contract manufacturing, continues to create massive change in the world of business. This revolution creates both opportunities and challenges for organizations, managers and professionals of all types. Plunkett’s Outsourcing & Offshoring Industry Almanac covers these sectors in detail. HOUSTON, Texas – Plunkett Research, Ltd. recently announced an important market research and competitive analysis reference report, Plunkett’s Games, Apps & Social Media Industry Almanac, 2016 edition. A complete market research report, including forecasts and market estimates, technologies analysis and developments at innovative firms. HOUSTON, Texas – Plunkett Research, Ltd. recently announced an important market research and competitive analysis report, Plunkett’s Advertising & Branding Industry Almanac, 2016 edition. A complete market research report, including forecasts and market estimates, technologies analysis and developments at innovative firms. The advertising business is going through rapid changes due to digital media and globalization. Meanwhile, more than ever before, advertisers who want to create a seamless global brand need the services of multinational agencies and consultants who can help them in dozens of countries worldwide. This entry was posted in News on April 29, 2016 by Jack Plunkett. HOUSTON, Texas – Plunkett Research, Ltd. recently announced an important market research and competitive analysis report, Plunkett’s Banking, Mortgages & Credit Industry Almanac, 2015 edition. A complete market research report, including forecasts and market estimates, technologies analysis and developments at innovative firms. This entry was posted in News on February 4, 2015 by Jack Plunkett. 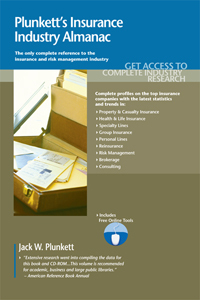 HOUSTON, Texas – Plunkett Research, Ltd. recently announced an important market research and competitive analysis report, Plunkett’s Insurance Industry Almanac, 2015 edition. A complete market research report, including forecasts and market estimates, technologies analysis and developments at innovative firms. Our CEO Jack Plunkett accepts a limited number of select speaking opportunities each year, both in the U.S. and in other nations. He has some remaining availability for 2015, and also can be booked now for early 2016. Insurance and risk management make up an immense global industry. Worldwide insurance premiums totaled about $4.75 trillion in 2014, up from $4.64 trillion in 2013. This was equal to about 6.5% of global GDP. Global life insurance premiums were $2.65 trillion during 2014, while all other types of insurance totaled $2.10 trillion. In emerging nations, where the fastest insurance market growth is to be found, total premiums in 2013 were about $788 billion, up by 7.4% over the previous year. Life insurance premiums were up 6.4% to $408 billion in 2013. Meanwhile, non-life premiums in emerging markets made a solid gain of 8.3% to $380 billion (the Chinese market alone rose 16% to $126 billion). Premiums on a per capita basis remain very low in much of the world, pointing to excellent long-term opportunity insurance products of all types, including annuities. It would be hard to overstate the importance of emerging nations, especially China, India, Brazil and Indonesia, to the future growth of the insurance industry. Much of the world is still clearly a fertile field for expansion of companies that are willing and able to invest time and money in emerging markets. Total premiums in China were $284 billion in 2013, up from $246 billion in 2012. India’s premiums in 2013 stagnated compared to 2012, reaching about $66 billion. As the market in China expands, so do markets in other rapidly developing countries such as India, and areas such as Eastern Europe. Insurers are hoping to cash in on the growing markets with a variety of products, including “microinsurance” policies designed to appeal to people unfamiliar with the need for insurance coverage. The beauty of the effort for insurers is that as these markets grow and mature, so do premiums, which are rising at a far greater rate than those in established markets such as the U.S. and Japan. Health care costs continue to rise in the U.S. and throughout the developed world. Total U.S. health care expenditures were estimated to be $3.09 trillion in 2014, and are projected to soar to $3.57 trillion in 2017. The health care market in the U.S. in 2014 included the major categories of hospital care ($959.9 billion), physician and clinical services ($618.5 billion), dental services ($122.4 billion) and prescription drugs ($290.7 billion), along with nursing home and home health care ($248.5 billion). Medicare, the U.S. federal government’s health care program for Americans 65 years or older, provided coverage to an estimated 54.0 million seniors in 2014. National expenditures on Medicare for fiscal 2014 were projected to be $615.9 billion, including premiums paid by beneficiaries. By 2030, the number of people covered by Medicare will balloon to about 81.4 million due to the massive number of Baby Boomers entering retirement age. Medicaid is the federal government’s health care program for low-income and disabled persons (including children) as well as certain groups of seniors in nursing homes. National expenditures on Medicaid totaled an estimated $508.0 billion in 2014. The majority of that expense is paid for by the federal government. However, the states pick up a significant share of the cost, which is a massive burden on state budgets. Health spending in the U.S., at about 18% of Gross Domestic Product (GDP) in 2014, is projected to grow steadily. Health care spending in America accounts for a larger share of GDP than in any other country by a wide margin. Despite the incredible investment America continues to make in health care, 13.4% of people in the U.S. (42.0 million) lacked health care coverage for the entire year of 2013 (down from 48.0 million the previous year). For some, insurance was unavailable or unaffordable. In other cases, a lack of insurance was due to a personal decision not to pay for it. This brief message is part of a series that shows you how to get the most out of Plunkett Research Online by using the exciting new industry analytics data that is now part of our service. We’ve added tremendous value and utility for our online subscribers. Let’s say that you want to know the forecasted growth for the Computer Facilities Management industry in the U.S.
Go to the Computers and Software Research Center on Plunkett Research Online. 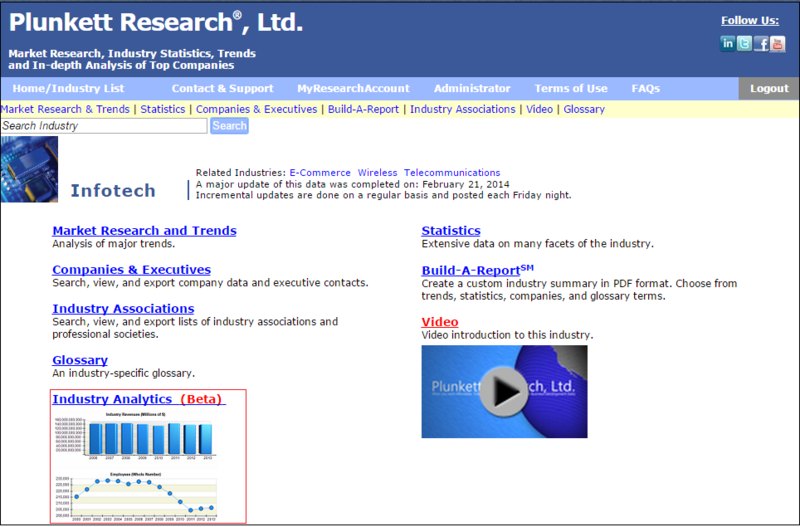 Then click on Industry Summary. Here you are able to see current revenues ($43.9 billion), current annual growth rate (5.0%), historical growth rate for the past seven years (6.52%), projected revenues for the year 2021 ($71.7 billion), and the projected annual growth rate from 2014-2021, (6.4%). You are also able to view a 7-year chart of industry revenues growth along with a chart of changes in employment, all with just a couple of clicks! That’s the power of our new industry data at work! 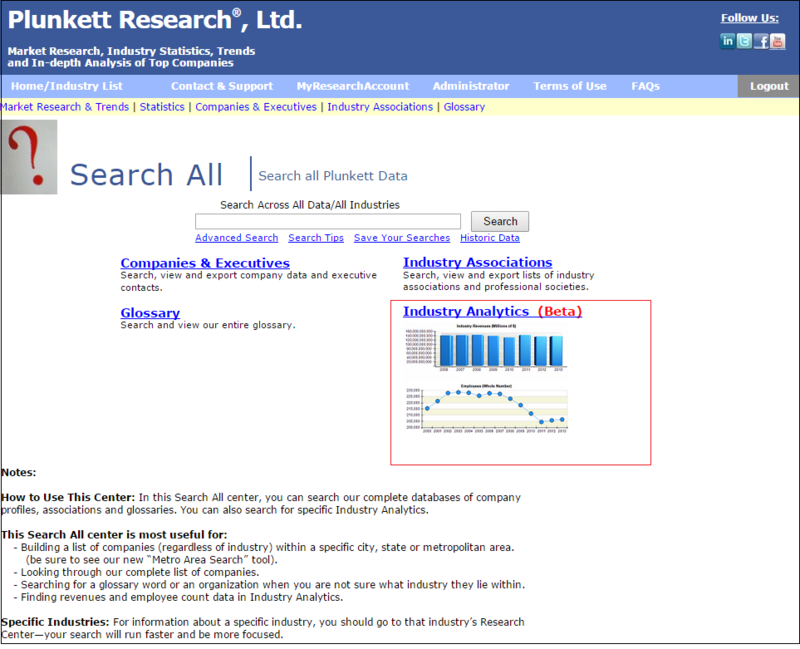 If you are a current subscriber to Plunkett Research Online, then please log in to www.plunkettresearchonline.com to try out the new industry analytics tools today! If you are not a subscriber, please contact us for your free trial access at info@plunkettresearch.com You’ll be very pleased by our terrific market research, easy-to-use data tools, and great prices! 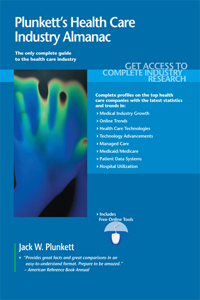 HOUSTON, Texas – Plunkett Research, Ltd. recently announced an important market research and competitive analysis reference report, Plunkett’s Health Care Industry Almanac, 2015 edition. A complete market research report, including forecasts and market estimates, technologies analysis and developments at innovative firms. 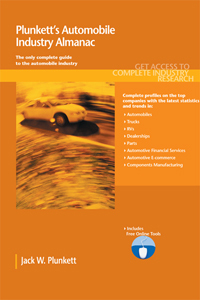 HOUSTON, Texas – Plunkett Research, Ltd. recently announced an important market research and competitive analysis reference report, Plunkett’s Automobile Industry Almanac, 2015 edition. A complete market research report, including forecasts and market estimates, technologies analysis and developments at innovative firms. HOUSTON, Texas – Plunkett Research, Ltd. recently announced an important market research and competitive analysis reference report, The Almanac of American Employers, 2015 edition. A complete market research report, including forecasts and market estimates, technologies analysis and developments at innovative firms. 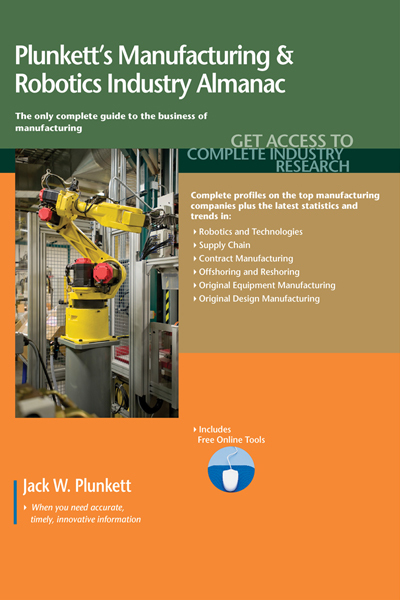 HOUSTON, Texas – Plunkett Research, Ltd. recently announced an important market research and competitive analysis reference report, Plunkett’s Manufacturing & Robotics Industry Almanac, 2015 edition. A complete market research report, including forecasts and market estimates, technologies analysis and developments at innovative firms. HOUSTON, Texas – Plunkett Research, Ltd. recently announced an important market research and competitive analysis reference report, Plunkett’s Airline, Hotel & Travel Industry Almanac, 2015 edition. A complete market research report, including forecasts and market estimates, technologies analysis and developments at innovative firms. 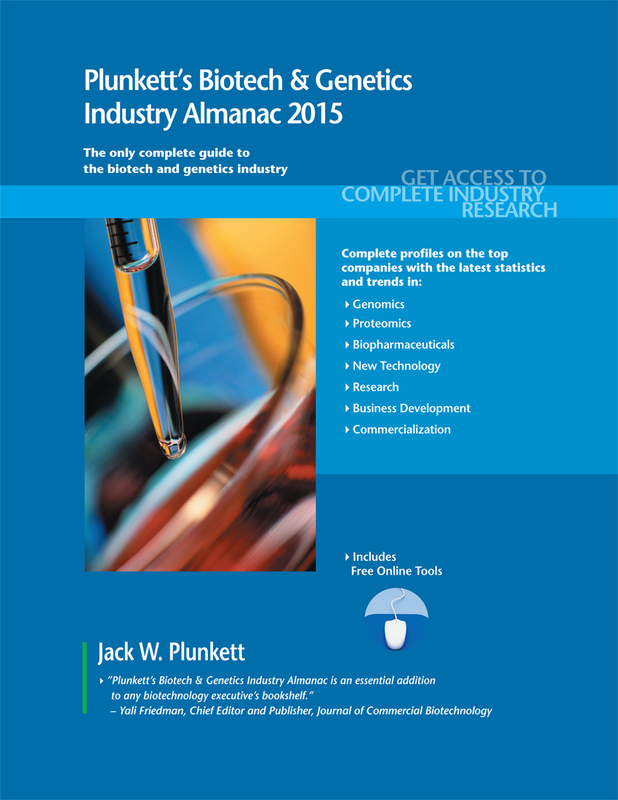 HOUSTON, Texas – Plunkett Research, Ltd. recently announced an important market research and competitive analysis reference report, Plunkett’s Biotech & Genetics Industry Almanac, 2015 edition. A complete market research report, including forecasts and market estimates, technologies analysis and developments at innovative firms. HOUSTON, Texas – Plunkett Research, Ltd. recently announced an important market research and competitive analysis reference report, Plunkett’s Telecommunications Industry Almanac, 2015 edition. A complete market research report, including forecasts and market estimates, technologies analysis and developments at innovative firms. No other industry touches as many technology-related business sectors as telecommunications, which by definition encompasses not only the traditional areas of local and long-distance telephone services, but also advanced technology-based services including wireless communications, the Internet, fiber optics and satellites. Telecom is also deeply intertwined with cable TV systems, since cable companies are now aggressively offering local exchange service and Internet service. The relationship between the telecom and cable sectors has become even more complex as telecom companies are now selling TV via IP (Internet protocol) services, competing directly against cable for consumers’ entertainment dollars. HOUSTON, Texas – Plunkett Research, Ltd. recently announced an important market research and competitive analysis reference report, Plunkett’s Almanac of Middle Market Companies, 2015 edition. A complete market research report, including forecasts and market estimates, technologies analysis and developments at innovative firms. Our new Plunkett’s Almanac of Middle Market Companies and our online Middle Market Industry Research Center are designed to be time-saving business development tools for professionals, marketers, sales directors, consultants and strategists seeking to understand and reach middle market American companies. It will also be of great use to placement, recruiting and human resources professionals, as well as professionals working in economic development, lending and media. HOUSTON, Texas – Plunkett Research, Ltd. recently announced an important market research and competitive analysis reference report, Plunkett’s Chemicals, Coatings & Plastics Industry Almanac, 2015 edition. A complete market research report, including forecasts and market estimates, technologies analysis and developments at innovative firms. There are approximately 250 million cars and light trucks in operation in the United States. Around the world, there were about 1.1 billion vehicles on the road in 2014, a number that is growing by roughly 50 million yearly. All major car makers are aggressively pushing their smaller, high efficiency vehicles due to both high gasoline prices and government mandates that auto manufacturers meet high average miles-per-gallon rules. At the same time, engineers are pushing technological changes in their larger cars and trucks in order to enhance their fuel efficiency. GM is betting heavily on its Chevrolet Cruze, a small sedan capable of 36 miles per gallon (mpg) on the highway and stuffed with convenience features that consumers appreciate. Ford’s revamped Fusion earned rave reviews, and it comes in either a hybrid model or a standard engine version that gets 31 mpg on the highway. Chrysler is relying heavily on its relationship with Fiat for new, fuel efficient models. Honda, Volkswagen, Toyota, Hyundai, Nissan and Peugeot all have invested in new, advanced small cars. All major luxury brands like Mercedes, BMW, Lexus and Audi have relatively small cars on the market and will steadily introduce a wide range of fuel efficient designs. BMW introduced its iSeries high efficiency cars in 2013, including a three-cylinder engine that is part of a new plug-in hybrid. In 2012, the Obama Administration pushed through new fuel efficiency rules that will require an average 54.5 MPG for new cars and light trucks in 2025. This is creating a scramble at auto makers to design small, light vehicles that will still be popular with consumers—a difficult task at best. Car maker profits are likely to suffer in the process. Both consumers and emissions regulators are taking a renewed interest in advanced automobile technologies. Clean diesel engines, like those offered in new cars from BMW, Volkswagen and Mercedes-Benz, offer exceptional performance and fuel economy while providing quiet, vibration-free running similar to that found in gasoline-powered cars. Clean diesel offers a particularly attractive alternative to hybrid technology for those who seek fuel efficiency, and it is already widely used in passenger vehicles in Europe. Meanwhile, the use of ethanol as a gasoline additive in America has grown rapidly, whether or not it makes any environmental or economic sense, thanks to requirements enacted by Congress. Meanwhile, technology advancements are driving greater safety in vehicles. Cars that are at least partially self-driving will be widely available by 2025, which may reduce accidents by 20% to 50%, depending. Hybrid and plug-in cars featuring advanced, lightweight, long-range batteries based on nanotechnology may be on the market by 2025. A looming question for auto makers is how demand for cars will change, as young consumers are becoming less interested in owning cars and are leaning towards car-sharing services like Zipcar and ride services like Uber. In the U.S., analysts, executives and government planners are introduced to a vital question: whether or not American manufacturing is entering a period of renaissance. The answer is both yes and no. Manufacturing employment has increased modestly in recent months, growing by a total of 201,000 during 2012 and 79,000 in 2013. (2014 has likewise shown gains so far.) There were approximately 12 million people employed in manufacturing in the U.S. as of 2013, growing steadily since the depths of the recent recession, but down dramatically from 19 million in 1980. Much of manufacturing’s recent rebound has been driven by large improvements in the automobile sector, along with strong demand for oil and gas field equipment as well as medical supplies and building materials. However, advances in factory productivity, including growing investment in robotics, will dampen job creation. In other words, factory output can easily increase faster than factory employment due to growing investment in robotics. Today, the growing use of robotics as well as the rising wages and other costs in offshore manufacturing centers, particularly China, is fueling intense debate about the future of global manufacturing. Supply chain managers on the corporate side, along with analysts and planners on the government and economic side, are attempting to develop strategies for dealing with these changes on a nation-by-nation basis. To begin with, costs are clearly rising substantially in China, which has long been the world’s manufacturing growth engine. The most important change is the very dynamic situation in wages paid to Chinese factory workers. Wages have been rising steadily, growing 14% on average during 2012 and 12.3% during 2011. For 2013 and 2014, increases are estimated at 10% to 15% per year. The International Federation of Robotics (IFR) estimated the total, worldwide base of operational industrial robots at the end of 2012 was about 1.5 million. Plunkett Research estimates that this base will expand to approximately 1.8 million by the end of 2014. The global value of industrial robots sold during 2012 was placed by IFR at $8.7 billion. The total value of robotic systems, including software, accessories and engineering, sold during 2014 will total approximately $29 billion, according to Plunkett Research. Industrial robots are selling at a rate of about 162,000 yearly as of 2014. Robotics are most visible in manufacturing plants, where they can run efficiently 24/7. However, by 2025, we will see wide use of “service” robots in such tasks as hospital and hotel services (cleaning, carrying and communicating), and similar uses in restaurants and retail stores. The likely growth in the minimum wage in the U.S., combined with the growing capabilities and dropping prices of service robots, will foster this trend. HOUSTON, Texas – Plunkett Research, Ltd. recently announced an important market research and competitive analysis reference report, Plunkett’s Wireless, Wi-Fi, RFID & Cellular Industry Almanac, 2015 edition. A complete market research report, including forecasts and market estimates, technologies analysis and developments at innovative firms. Global wireless subscriptions for cell phones and mobile devices total nearly 7 billion. Advanced cellular technologies, such as LTE and HSPA, are providing lightning-fast access to voice, text and the Internet. Smartphones and tablets like the iPad are selling at a blazing pace worldwide. In fact, mobile devices are rapidly replacing desktop PCs as the computing device of choice, which makes wireless service more vital. 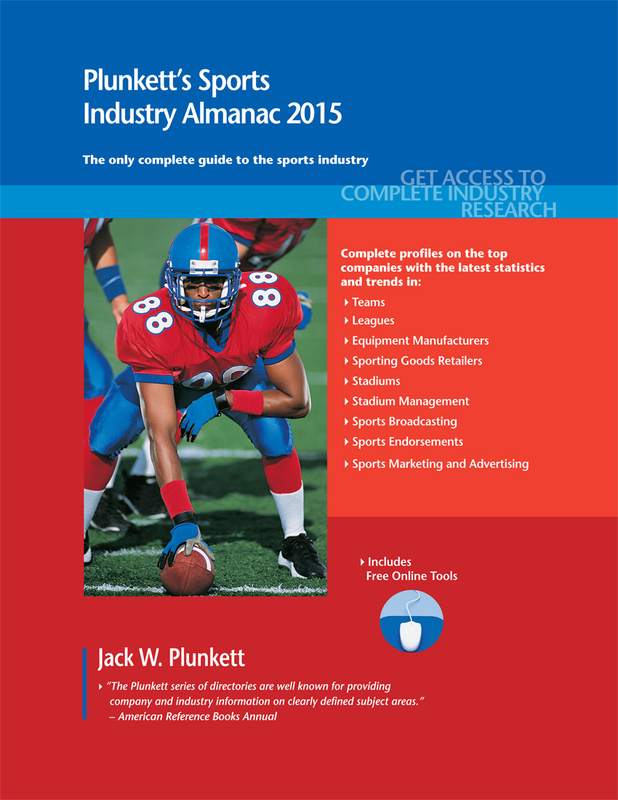 HOUSTON, Texas – Plunkett Research, Ltd. recently announced an important market research and competitive analysis reference report, Plunkett’s Sports Industry Almanac, 2015 edition. A complete market research report, including forecasts and market estimates, technologies analysis and developments at innovative firms. HOUSTON, Texas – Plunkett Research, Ltd. recently announced an important market research and competitive analysis reference report, Plunkett’s Outsourcing & Offshoring Industry Almanac, 2015 edition. A complete market research report, including forecasts and market estimates, technologies analysis and developments at innovative firms. 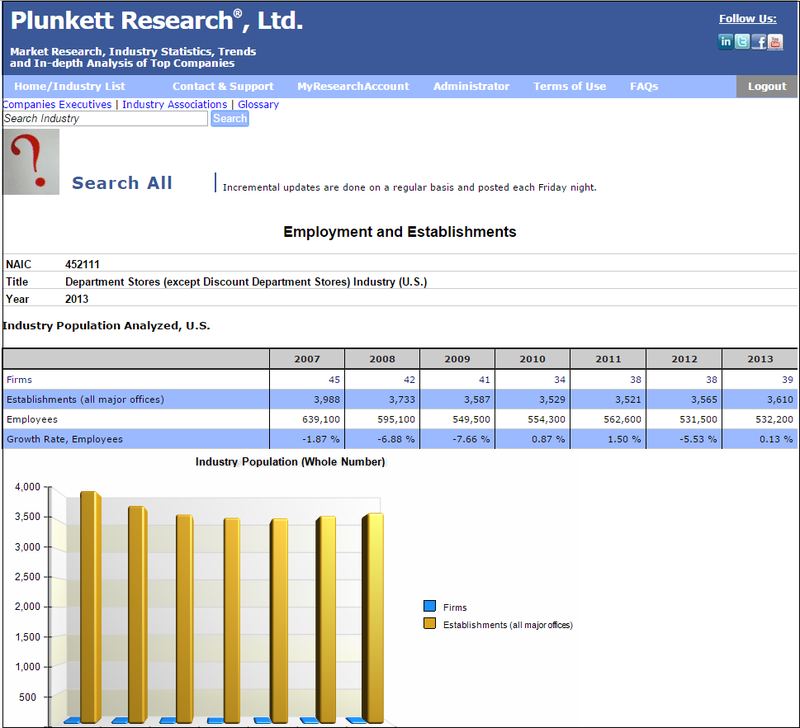 This is the second of a brief series of emails to show you how to get the most out of the new Industry Analytics tool that is now available within Plunkett Research Online. Let’s say you want to know how employment within department stores has changed over time. 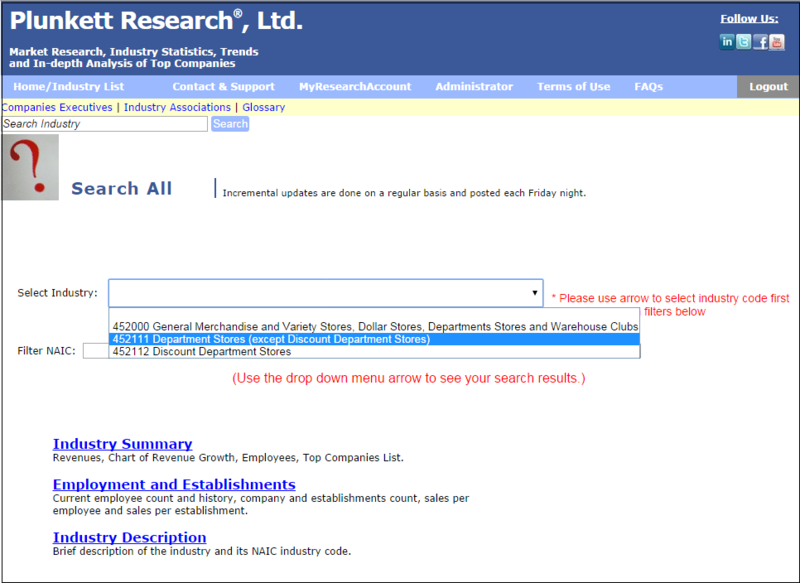 First, go to the Search All Center on Plunkett Research Online. Here, you will be able to choose from hundreds of specific industries. Use the drop down menu to start your search. In the Filter Keyword box, enter “Department Stores.” Click Filter. Then, click Employment and Establishments. 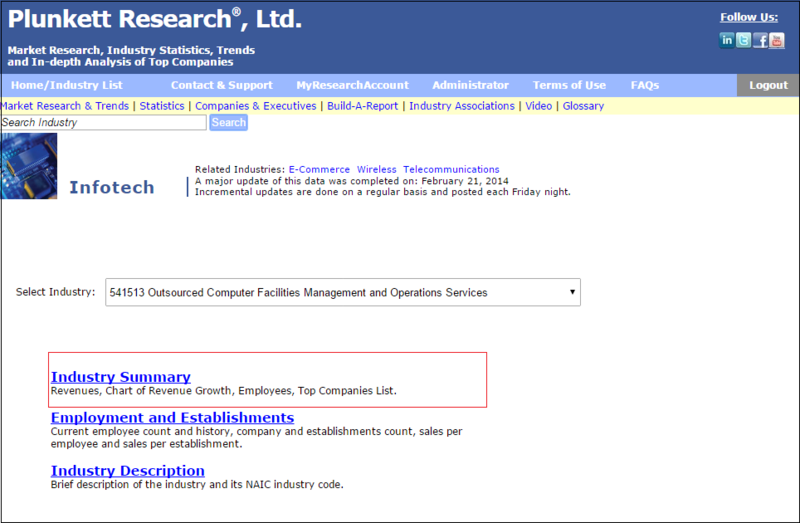 Here, you will find a seven-year history of employment, number of firms, establishments and more. 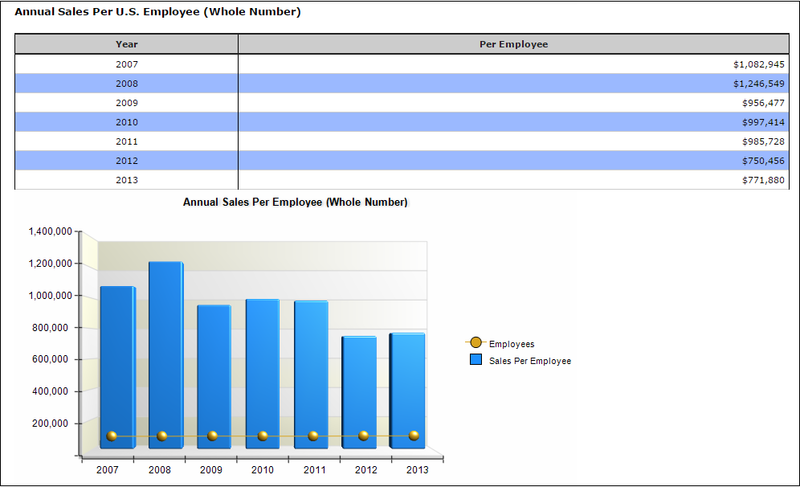 You can see that the employee count declined from 639,100 in 2007 to 532,200 in 2013. You can also see that the largest drop was in 2009, -7.66%. And, there’s a lot more vital data in the page you just created. Further down the page, you can see that the average yearly sales per establishment also dropped, from $19.8 million in 2007 to $17.6 million in 2013. 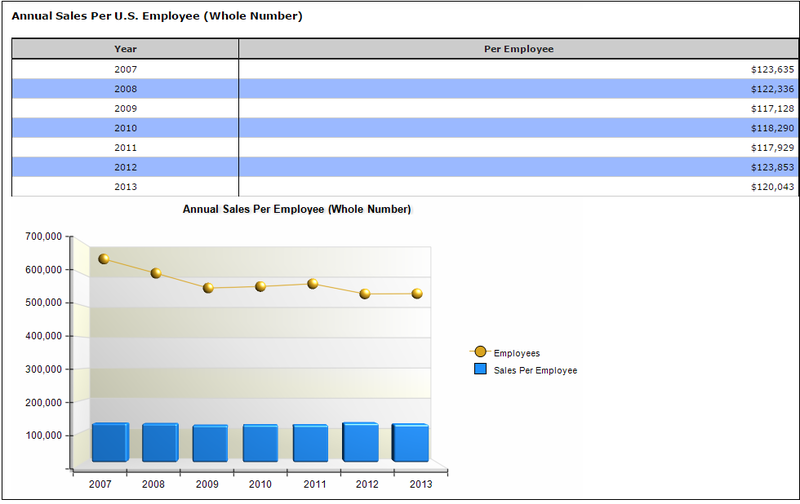 Finally, you will see that the average sales per employee has also dropped, from $123,635 in 2007 to $120,043 in 2013. That’s the power of Plunkett Analytics at work! If you are a current subscriber, then please log in to www.plunkettresearchonline.com to try out Analytics today! This is the first of a brief series of emails to show you how to get the most out of the new Industry Analytics tool that is now available within Plunkett Research Online. Let’s say you want to know the size of the natural gas utilities industry in the U.S., by revenues, and by employee count. While you’re at it, you’d like to see the projected growth of the industry. 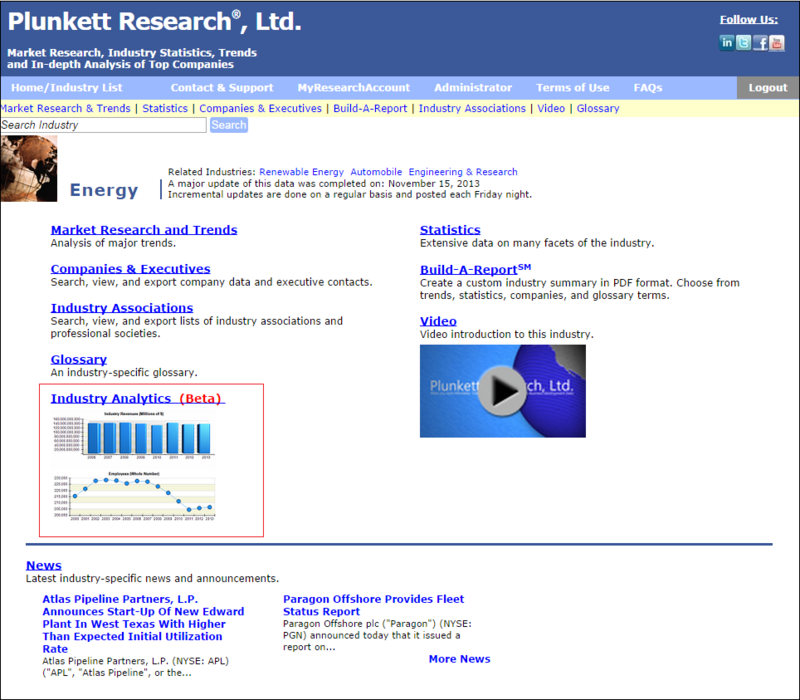 First, within Plunkett Research Online, go to your targeted Industry Research Center. In this case, the Energy & Utilities center makes sense. 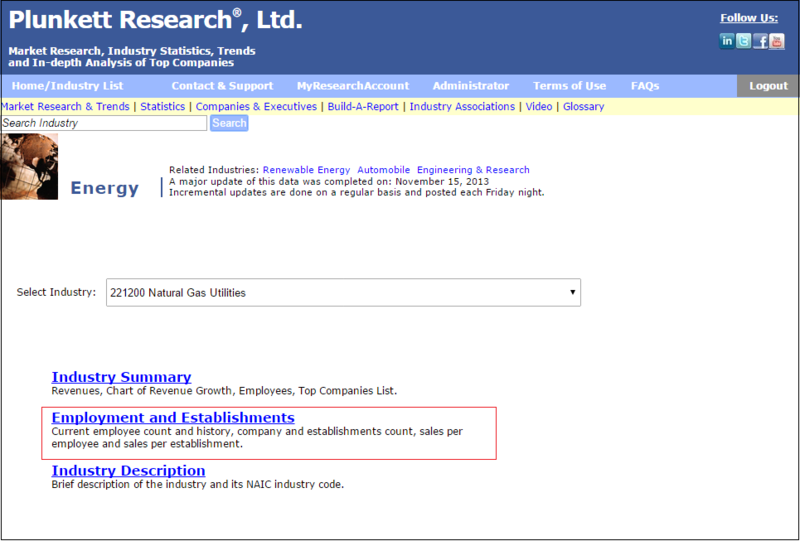 Select the industry that you are interested in from the drop down menu, in this case select 221200 Natural Gas Utilities. Now, with just a couple of clicks, you’ve gotten straight to the data you want: the most recent revenues for this industry ($111 billion) and the employee count (110,300). You’ve also found the projected yearly growth rate (0.79%) as well as projected revenues for the year 2021 ($126 billion). By the way, the Industry Summary that you’ve generated includes convenient links to profiles of the industry’s leading companies. While we’re at it, let’s find the number of firms in this industry. Click back to the Analytics page. Click Employment and Establishments. Here you will find the number of gas utilities firms (445) and the number of offices/establishments (2,450) for the latest year, plus historical information. 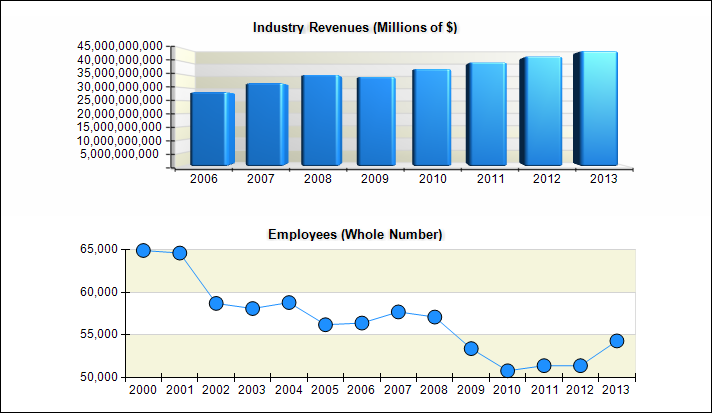 In addition, you will find average revenues per company ($119.3 million) and per employee ($771,880). The Sports Industry is a business combined of the “Big 4” in America, which include the National Football League (NFL), National Basketball Association (NBA), the National Hockey League (NHL) and Major League Baseball (MLB). The “Big 4” brings in about $23 billion in revenue during a typical year, but that’s just the tip of the iceberg. U.S. sporting equipment sales at retail sporting goods stores are $44.1 billion yearly. A reasonable estimate of the total U.S. sports market would be $485 billion yearly (and $1.5 trillion for the entire world). Sports, recreation and related supplies and services have been among the greatest new job engines over the past two years, and virtually all of these sectors are up substantially in job count since 2011. Our new Sports Industry Almanac 2015 is your key understanding to the global sports business.